The Yorkshire Dartboard is a forerunner of the now standard, London dartboard or as others may call it the ‘Clock’ dartboard, however, this dartboard has no treble bed or outer bullseye. The bullseye still scores 50 and is smaller than a standard bullseye on a standard dartboard. By the late 1920s the trebles ‘standard dartboard’ was introduced and remains the most popular dartboard in the world today. However, the ‘standard’ dartboard was not an overnight success in the UK. Initially, it had to compete with other existing target boards played across the United Kingdom. These have come to be known as ‘regional dartboards’ and were usually named after their region of origin of the where the dartboard was first made. For example, the Yorkshire Doubles board, Kent Doubles, the London Fives and the Manchester Log-end Board. 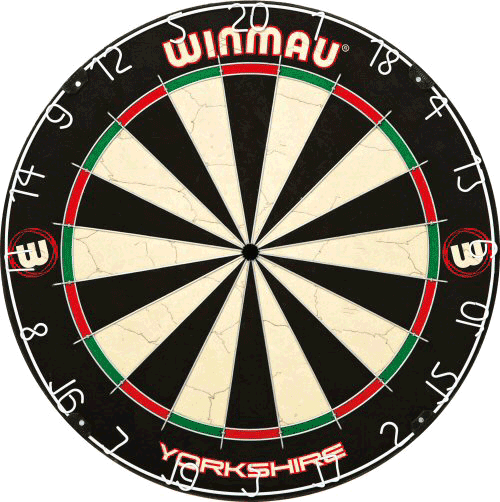 The Yorkshire board with has a ‘standard’ numbering system without trebles, The Manchester ‘Log-end’, The London 'East End' (Narrow Fives) and Ipswich (Wide Fives) Dartboards have a different numbering system. All these boards are still available and still played on in the UK (c 2018). However, they still remain regional and are played on less than the standard dartboard. Indoor League was a Yorkshire TV daytime TV program featured pub games played across the UK: Darts, Table Skittles, Ally Skittle, Bar Billiards, Pool, Table Football, Shove Ha'penny and Arm Wrestling! It was ‘Indoor League’ along with coverage of the News of the World Individual Championships that started bigger interest in darts on our television screens. In 1976 the BBC approach the BDO and said they would broadcast a World Championship event. The rest is history. Indoor League not only helped darts but it also introduced us to two of the most famous TV darts commentators Dave Lanning and Sid Waddell who sadly is no longer with us. The height and throwing distances for the Yorkshire dartboard differs than that of a standard dartboard. 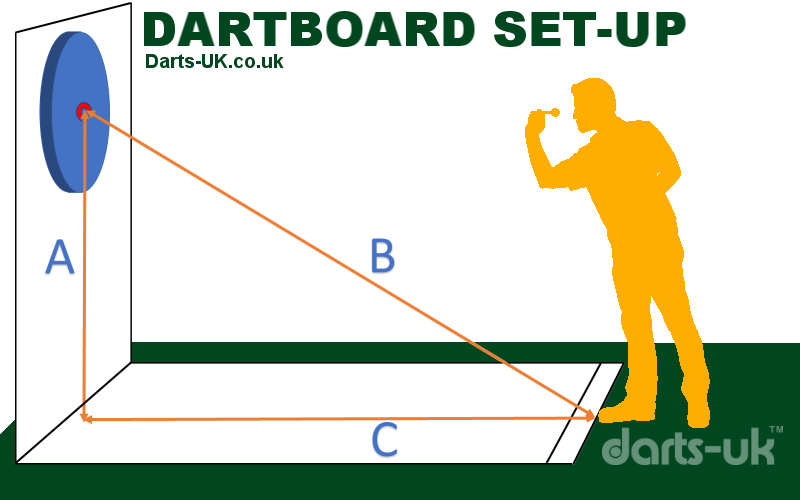 The Yorkshire dartboard is hung so that the centre is 5ft 6ins (1.676m) from ground level, the throwing line or 'oche' is 7ft 2ins (2.184m) from the dartboard face at ground level. The diagonal distance from the centre of the bull to the throwing line at floor level is 9ft (2.743m). The Yorkshire Dartboard: Some may disagree with the set-up I have listed above and this may be due to changes seemly adopted in parts of Yorkshire but not necessarily all. The information I have gathered from Yorkshire and Professional Dart players confirm this set-up, however, I am aware that some set the Yorkshire board up as per a standard clock board. A player may be told, if he asks, what number they scored, or what number required for the game, by the score announcer, but not the outshot. There is only a bull (50) and no outer bull on a Yorkshire Board. The first throw is deducted from the player's start number e.g. 501 and then from the subsequently reduced total. The scorer should show both the score obtain for the throw and the reducing total remaining. For fast practice, games play 301. For league and competition 501 and for pairs 701. In fact, any agreed starting number can be used but usually, the number should end 01 the reason for this is so a player must hit another part of the board other than the 20’s segment in order to win a game.